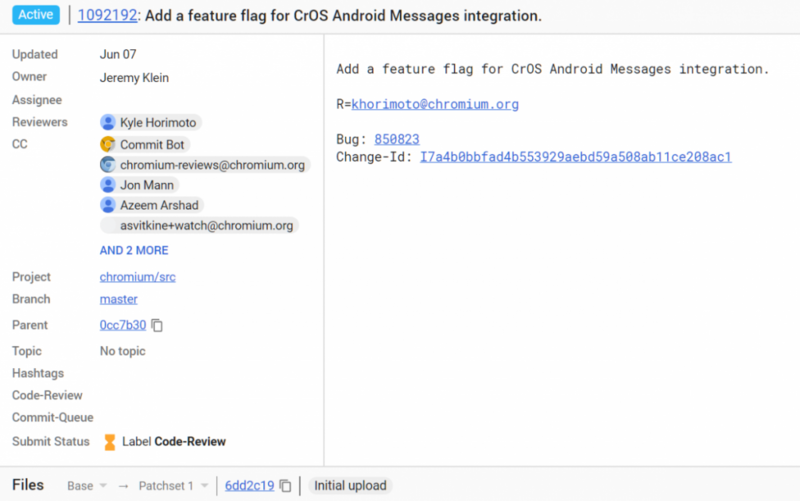 According to a new commit in the open source Chromium Gerrit, Google is preparing for Chrome OS and Android Messages to be better integrated. Chrome OS is Google’s operating system for laptops, set-top boxes, and more recently, detachables and tablets. Android Messages is the default SMS and RCS client on most Android devices. A marriage between the two seems odd considering the fact that Google is already preparing to launch a dedicated web client for Android Messages—but here we are. We saw earlier what the pairing process looks like on the smartphone side and that the web interface would support most popular web browsers such as Google Chrome, Mozilla Firefox, Microsoft Edge, Opera, and Apple Safari, but this is the first we’re hearing about anything Chromebook-specific. If anything, we would expect that a web client for Google Chrome would necessarily bring support for Chromebooks, but it seems that Google has more to offer for users running Chrome OS. If we learn more about what this “integration” means, we’ll let you know.